Here is a great interior page from Marvels Original ROM series! This is page #16 from issue #19. It's penciled by the great Sal Buscema. It's on standard 11x17 marvel stock and features Rom and his fellow Spaceknight buddy Karas! Feel free to ask me any questions and good luck! 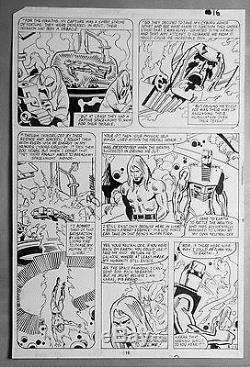 The item "Awesome ROM Marvel Original Comic Art Issue #19 Page #16 by Sal Buscema" is in sale since Tuesday, October 25, 2016. This item is in the category "Collectibles\Comics\Original Comic Art\Interior Pages". The seller is "vermontjedi" and is located in Charlotte, Vermont. This item can be shipped to United States, to Canada, to United Kingdom, DK, RO, SK, BG, CZ, FI, HU, LV, LT, MT, EE, to Australia, GR, PT, CY, SI, to Japan, to China, SE, KR, ID, to Taiwan, ZA, TH, to Belgium, to France, to Hong Kong, to Ireland, to Netherlands, PL, to Spain, to Italy, to Germany, to Austria, RU, IL, to Mexico, to New Zealand, SG, to Switzerland, NO, SA, UA, AE, QA, KW, BH, HR, MY, BR, CL, CO, CR, PA, TT, GT, SV, HN, JM.